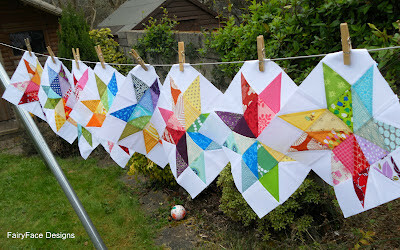 Modern Quilters Ireland - old: It's here....the Modern Irish Bee!! It's here....the Modern Irish Bee!! We had 2 people suggest this name, so we will take the first suggestion who was Judith! Congratulations Judith, will you email me your address details and I will pass them to Eva at Pippablue for your prize to be sent out. Thanks again to Pippablue for sponsoring the contest! So, I have been working away behind the scenes and I have set up the necessary structures for our new Bee! Woohoo, I'm very excited!! We are now ready to launch it, starting with the first month in July, and we will be running it through Flickr. We have 12 people who wanted to take part right away, so watch out for your invitation to the Flickr Bee group in your Flickrmail or email today. If you are not a Flickr member, you will need to set up a free account over there to take part. Over in the Flickr group I have 2 posts set up, one of which you need to read straight away -the "How Its All Going to Work" thread......which does exactly what it says on the tin! This is the basic guide to how the Bee works. The second thread is about what you need to do when it's your month as Queen Bee and is there for a reference when it comes to your month. I will take the first month (July) to get us kicked off and so that if its your first time in a Bee, you know what to expect. P.S. Agnes and Eleanor, I don't have email addresses for either of you, could you email me at fairyfacedesigns@gmail.com with your details please so I can set you up! This is going to be so great! This will be my first bee, so can't wait! Very excited, will check out the flickr stuffy on the weekend, thanks Cindy for organising and well done Judith for the name! I'm so glad you guys are excited and jumping in! Thanks for your posts, I would be waiting for similar interesting posts in future.